"Other project management software we looked at was too complicated to use without extensive training. Cabinet Makers Office, on the other hand, needed very little time to get started. I like that fact that my staff don't need to know a lot about the whole system just to use the specific area they need." 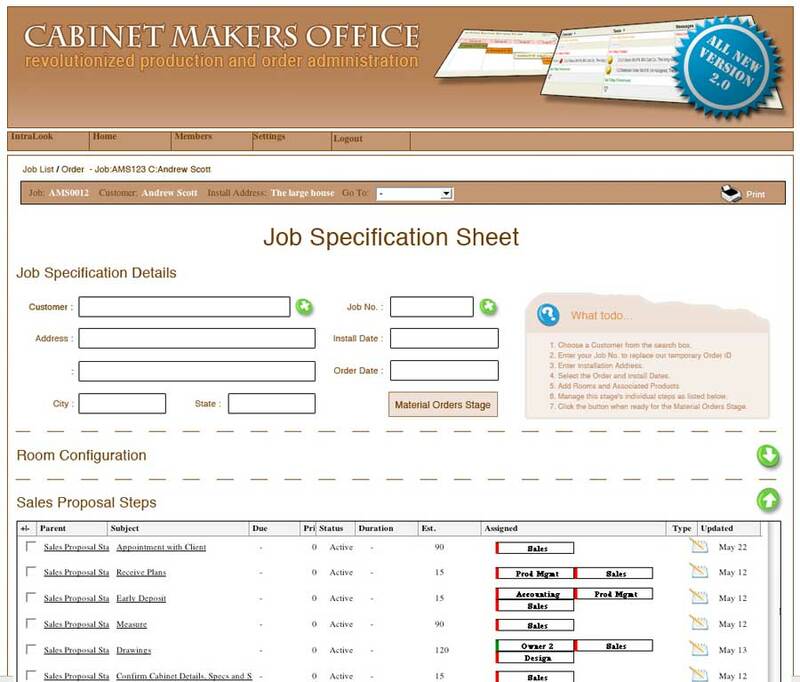 Cabinet Makers Office was developed specifically for the wood manufacturing industry. It combines order process management to keep a close eye on your cabinet production with the relations management functions required to keep track of your clients and staff. From the moment your customer walks through the door CMO's web-based software provides the easy to use tools for fast, secure communications, calendar scheduling and accountability tracking of your cabinet orders through completion. Being web-based there are no complicated networks to set up - at any computer with Internet access simply login to your IntranetSite provided as part of your software package. Enjoy your holiday knowing you can check on construction progress or correspond with staff quickly and easily at any time. Greater efficiency in your company translates to more time spent on the activities that earn income. Cabinet Makers Office provides you with the tools to multiply the effectiveness of your entire business. With intuitive calendar and task management you can quickly and easily schedule or reschedule your cabinet projects. At a glance the corporate Kiosk gives you information about who is working and what task they are currently engaged with. From the shop floor to the manager's office, the Kiosk gives live data for time spent on a task, remaining capacity for efficient use of equipment or staff resources, as well as showing who is off on lunch break. Document management such as uploading images to your website, storing client contracts, or sharing order specifications with your supplier is quick and painless. Choose the simple layout for accomplishing basic tasks with the IntraLook Summary highlighting scheduled calendar events, assigned tasks, and messages. More detailed functions are accomplished through a menu system. In consultation with manufacturing clients, CMO realized that most management software systems clients had tried were so complicated to learn and use they had to spend weeks of time to use them. CabinetMakersOffice created powerful tools with this in mind, requiring little more computer knowledge than turning on the power. Now the salesman or painter could simply login to the company website and with one glance see messages and tasks for the week. Touch screen functionality for the task Kiosk is one of CMO's newer features granting almost heard of connectivity between shop and administration. A live demonstration is worth a 1,000 simulated images!! To see a real live time on-line demo call 888-539-4664 Toll Free (North America) to schedule your appointment! One of the system's most powerful features is the tracking behind every page on the Intranet. As an administrator you can see when an item (IntraMail or IntraPage) is created and by whom, who has seen it and when, and who has replied or edited it. Where a project has numerous items associated with it or more than one person to whom tasks are delegated, see at a glance who has responded affirmatively that they know what their role is and who has yet to even see their new assignment. Schedule time consuming follow up only when needed. Cabinet Makers Office was developed in consultation with persons actively involved in custom cabinet manufacturing. Procedures are a series of steps in a process such as manufacturing that can be created, customized, and altered to suit the function of the company. For instance, a procedure is needed to handle a customer's order from the initial consult through to installation and servicing. Add a new customer's contact information to the database from an online sales form easy to use by the sales or administrative staff. Or, in the case of an existing customer, enter that data automatically onto the sales form. Manage appointments and schedule pre-sales tasks such as measuring and project cost quotes. Start a new manufacturing order for the customer with single entry data on the Order Form carried through to the various tasks that make up the entire construction process through installation. Quickly create or adjust task items to reflect the changing requirements of a project. Automatically assign these individual construction tasks to the responsible employee. The employee sees tasks assigned to them on the calendar or on their daily ToDo list. Manage task delegation, item due dates, and priorities easily from a centralized location. Print the order details and reports. View a project(s) on a calendar showing any or all employees and their delegated tasks. With the built-in permission controls you can give employees just the right amount of access to be as productive as possible with their time. Have them login from their work station (touch screen enabled!) and see what you want them to see - their schedule of active orders for the day or week. Administrators see as much or as little as you wish at one time. Call today to set up your live online demonstration appointment! CALL 1.888.539.4664 (toll free North America) or send an email. Limited Time Offer: "Competitive Upgrade" for your existing Project Management Software.